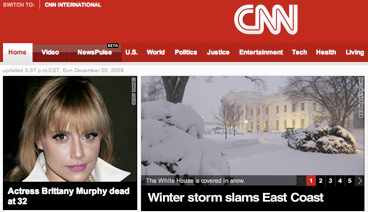 Many news outlets were busy today breaking the news of actress Brittany Murphy’s passing. One article on the subject that caught my attention though was on CNN. It wasn’t so much that people like Ashton Kutcher or Jessica Simpson were used as sources, it was how they were used as sources. I first saw news of Murphy’s passing on Twitter. I checked CNN and didn’t see anything at the time so I headed over to TMZ to see if they had anything, which they did. I read whatever it was but still held a bit of skepticism until CNN flashed the headline some time later. The CNN article I do remember though (I have attached a screenshot of this article below in case it changes). What I find interesting about it is the use of using social networking sites as sources. There is a whole other debate we can have on that issue, CNN correctly cited the sources they did pull from the Web. In one part, you will find them mention a post on her Facebook wall without mentioning who posted it by name. With privacy settings on Facebook, media outlets need to be wary of publishing wall posts and names – especially for non-public figures. However, they did pull two Tweets from Simpson and Kutcher. Since both have unprotected Twitter accounts, their tweets are available for the public to see and thus fair game to be published. The article is good read to stir up a bit of classroom discussion on social networking and how the media is using it. Is this Journalism 2010 or just a case of taking an easy way out to fill space?